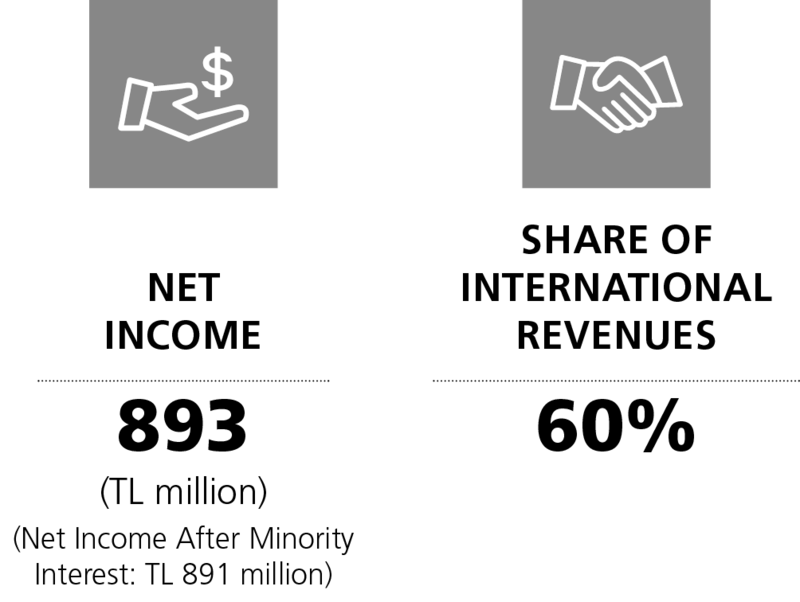 Arçelik provides products and services to its customers in more than 100 countries with its manufacturing plants in Romania, Russia, China, South Africa, and Thailand, in addition to Turkey. Arçelik, the top ranked company in the Turkish Patent League, filed the highest number of international patent applications. By capitalizing on its 25-years of R&D experience, innovative power, and technological competence, Arçelik introduces distinctive, value-added, innovative, and environmentally-friendly products to global markets. In 2015, Arçelik opened an R&D center at the Cambridge University Science Park in the UK, which is an important step towards the expansion of global R&D activities for the Company. A+++ energy class no-frost side-by-side type refrigerator. The Company continued to support global climate change initiatives in 2015. Indeed, Arçelik participated in the "New Global Alliance for Energy-Efficient Appliances" program by UNEP in South Africa and Thailand. It represented the Turkish white goods industry in the UNFCC – 21st Paris session of the Conference of the Parties in December 2015. Arçelik has also contributed to the country's energy saving corresponding to a total capacity of six wind turbines each with 2.5 megawatt by recycling over 100,000 products consuming a high level of energy at the Eskişehir and Bolu facilities, which is a first in the country's industry. 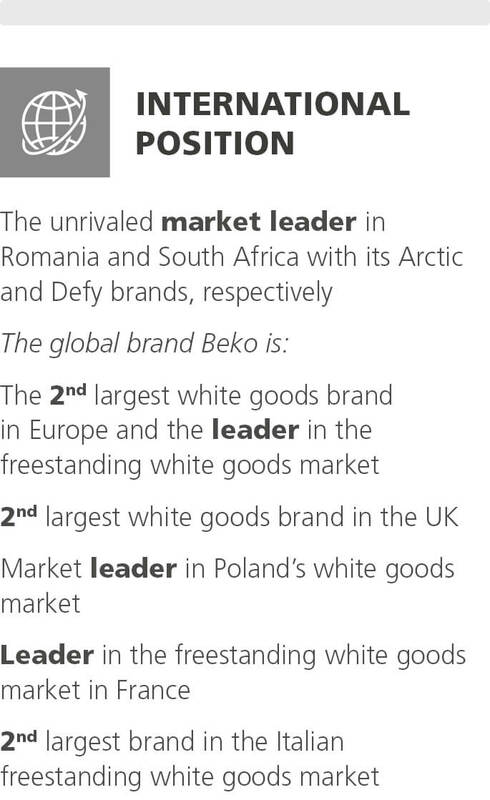 The number of global sales and marketing companies reached 27 with new Beko offices in the Balkans, Malaysia and Vietnam. The Thailand refrigerator production plant, which broke ground in January 2015, started production in December 2015. Despite contractions and economic fluctuations in key markets, Arçelik A.Ş. has maintained its strong and consistent growth, boosting its operational profitability. In 2015, the Company grew13.2%, posting consolidated turnover of TL 14,166 million. The Company's net profit totaled TL 893 million. International revenues accounted for 59.6% of its consolidated turnover. 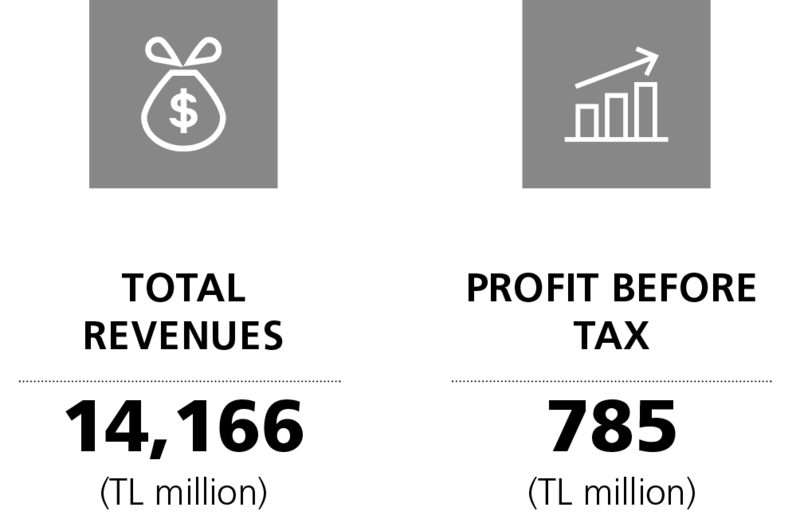 Among the first 30 companies in BIST Sustainability Index, and an "AAA" rating in the Morgan Stanley Capital International (MSCI) Global Sustainability Index Series, the best ranking in the industry. "E-waste Heroes" award by WEEE Management System. TPE, Turkish Patent League champion and the "Company with the Highest Number of International Patent Applications." 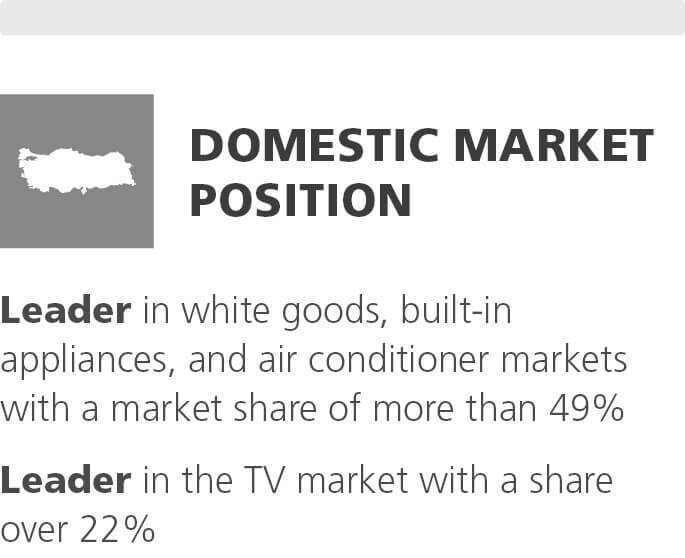 Arçelik, the "Most Popular Brand" in white goods and consumer electronics category based on the Lovemarks of Turkey Survey. 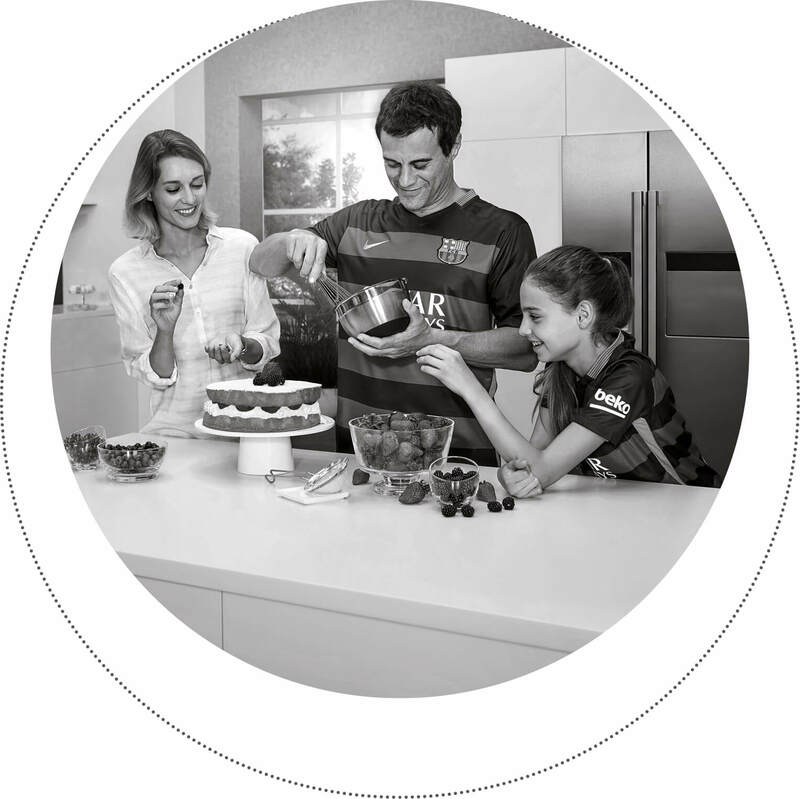 Beko, the first home appliances brand awarded with "Green Brands" in Germany. Grundig Drier with "Test Winner"award given by the German testing agency Stiftung Warentest. Two IF Design awards for LUMINIST Cast Cookers with VUX technology (Virtual User Experience). The Turkish Exporters' Assembly "R&D Leadership" and "Technology Development Leadership" awards, as the only Turkish company to be the finalist at the International IMP³rove Innovation Contest, large-scale companies category. 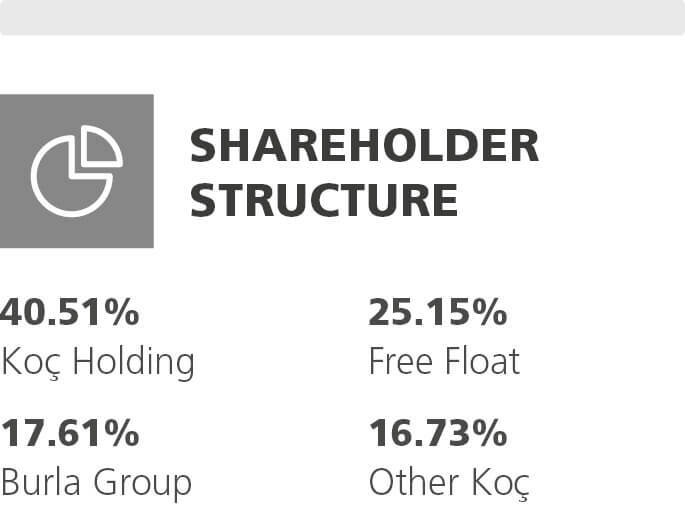 In line with its long-term goals, Arçelik A.Ş. supports its vision "Respects the Globe, Respected Globally" with a sustainable profitable growth strategy. Having defined brand, design, quality, technology, and innovation as the main pillars of the Company strategy, Arçelik will continue to invest relentlessly in these areas in all regions. Arçelik aims to enhance its capability to offer pioneer, distinctive, value-added, innovative, and environmentally-friendly products and solutions. The Company will continue to consider new markets and business opportunities with higher potential, through its strong and consistent financial structure, reinforcing sustainable growth. In this regard, it will focus on growing in the ASEAN region with its plant established in Thailand, while maintaining its investments in its current businesses, and prioritizing the opportunities in regions where it is not currently operating. Arçelik A.Ş. aims to bolster its global position by boosting its international revenues, firming up its domestic market leadership, and supporting its growth with new business fields and investments in new regions. The Company recognizes its employees as the greatest asset in its quest to set and achieve ambitious future goals, investing in current and new business fields. Therefore, Arçelik continues to invest in human resources by helping its employees to develop professionally, for the ultimate goal of maximizing the effectiveness of its global organization.